Good morning everyone, and a warm welcome to Professor Clive Roberts, Director, Birmingham Centre for Railway Research & Education, University of Birmingham; and to all our partners. This venue brings back many fond memories. Firstly, I studied at Raffles Institution which was located across the road in the 1960s, and the Capitol was a favourite haunt where we “hanged out” after school in unproductive pursuits. Secondly, it is almost 50 years to the day that i entered the University of Toronto as a first year student in Mechanical Engineering. So, it is particularly gratifying for me to be talking to a group of our engineers today. Land transport issues in Singapore, and in particular those pertaining to the MRT have attracted a disproportionate share of public interest and political attention in Singapore in recent years. The major disruptive events of December 2011 and more recently last year, have focused continued public interest and attention on the challenges we face. The plus, if you can consider it as such, is they have given the impetus for the Ministry of Transport, the Regulator and Public Transport Operators to re-examine how we finance and manage the whole public transport system. Recent milestones for SMRT in transiting to the New Rail Financing Framework and privatisation under Temasek Holdings should be viewed as steps in this direction, allowing SMRT to focus more sharply on delivering a safe, reliable and commuter-centric public transport service. In addition, the imperative to rebuild trust and instil confidence in the commuting public on the reliability of the MRT as an option to private cars for daily commute has resulted in the recognition that more investments in engineering are needed in order to maintain and sustain the reliability of the ageing and new systems through their life cycles. Refurbishing our older generations of trains and expanding our Rolling Stock with new trains. Getting these done on time with the limited hours available each night and without unduly affecting commuter service is a tremendous engineering feat that our colleagues are embarked on. We are on track with all these projects, and most will be completed by 2018. Investing in hardware is not enough. We must also invest in our people, and the software and systems and processes to enable our people to do their work better. In this regard, we have intensified efforts to: (1) Build a Pipeline of Rail Professionals, (2) Operationalise the Maintenance Operations Centre, and (3) Adopt Predictive Maintenance through Condition Monitoring. The effort to build a pipeline of Rail Professionals has become not just an SMRT, but an urgent industry effort. There is increasing recognition that the massive investments of some $60 billion that Singapore is making to double its rail network by 2030, must be supported by the building up of an indigenous rail engineering capability. SMRT alone will more than double our number of engineers to 400 by 2017, from the 191 we had in 2012. More than simply increasing the intake and number of Rail Engineers, we are committed to raising the competency levels of our professional workforce, which includes Senior Technicians, Line Managers, Senior Engineers, Principal Fellows and at the epitome of the profession, the Chartered Engineers. It is in this context that I am pleased to launch the Postgraduate Certification in Urban Railway Engineering (Singapore) through SMRT’s collaboration with the University of Birmingham. The University of Birmingham is a leading university in the UK that offers degree courses in railway engineering. Our engineers can step up in their career and professional development by attaining this Postgraduate Certificate with the University. Such a programme is most timely. We know that the challenges we face today are complex and multi-disciplinary. It is no longer tenable to solely depend and rely on OEM manuals for technical solutions to overcome and solve problems, as was possible in the early years of our network development. Our local operating conditions and challenges are becoming adaptive in nature. Often, there will be no ready answers. Relying on old mental models to solving problems is no longer sufficient as a formula. It is no longer just for Chief Engineers to be giving top-down engineering prescriptions to solve technical issues. Instead, it is more likely that Rail Engineering professionals at all levels must have the adaptive skills to identify and overcome current and future problems. We want to be able to do this proactively and predictively to avert faults even before they occur. Besides effective teams, we also need effective corroboration across functional areas, and in the Singapore context across organisations, because the design and build responsibilities are with the LTA, and there is more than one operator. With better and constant data inflow and fusion from predictive and monitoring tools from multiple systems, rail engineers have the opportunity to provide the leadership to sense-make, corroborate findings, and devise innovative solutions collaboratively across functional departments. Our partnership with the University of Birmingham is an important pillar for us to strengthen the calibre of our engineering professionals. A sound education and technical know-how among our Rail Engineers will be the basis for us to grow adaptive leaders who are ready and able to lead our workforce in solving tomorrow’s problems with confidence and innovation. Then, we will be better able to fulfil our mission of providing better journeys for commuters across our growing MRT network. A Facebook post by a worried mother went viral on the evening of 17 October as her autistic son went missing in the Somerset/ Killiney area around 4pm. A message was sent from Somerset MRT Station to alert the network. A Train Captain (TC) at Joo Koon MRT station saw the boy and approached him. Colleagues at Joo Koon confirmed his identity shortly after. Station managers Rashid, Khairi and Nasir sprang into action. Apart from informing the authorities and the rest of the network, they comforted the boy who had presumably went without food and drink for hours. Khairi purchased food for the boy and tried to calm him down by providing drawing materials. The case was closed when the boy’s father arrived at Joo Koon with police officers. Khairi said, “We felt relieved and happy because his parents must have been so worried about his whereabouts and safety. The boy looked hungry and exhausted, and we wanted to make him as comfortable as we could, before his parents arrived. Great teamwork between SMRT colleagues helped to safely reunite the lost boy with his mother. It’s yet another example of how we can all make a difference to people who use our transport services. 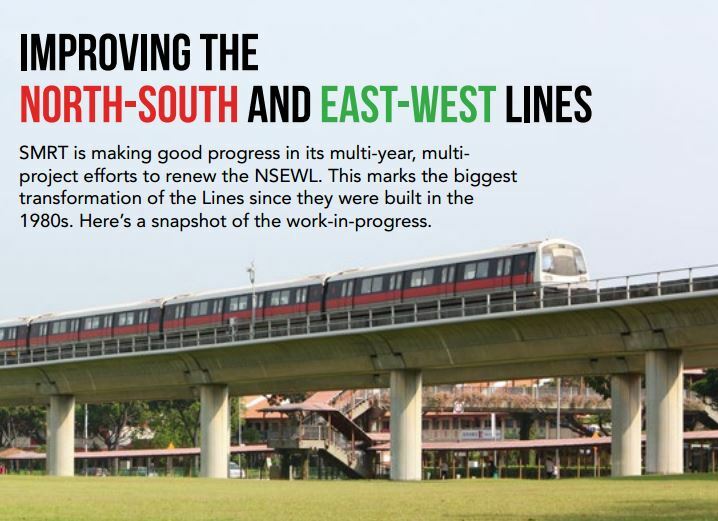 A tremendous amount of work is being put into renewing and upgrading the North-South and East-West Lines (NSEWL), Singapore’s oldest, longest and most heavily utilised MRT lines. The work takes place every day even as the rail network continues to serve passengers for around 20 hours a day and as the system copes with increased ridership. 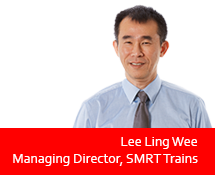 Following the inaugural publication in October 2015, Your Journey Matters – Edition 2 continues the story of SMRT’s rail transformation efforts on the NSEWL. 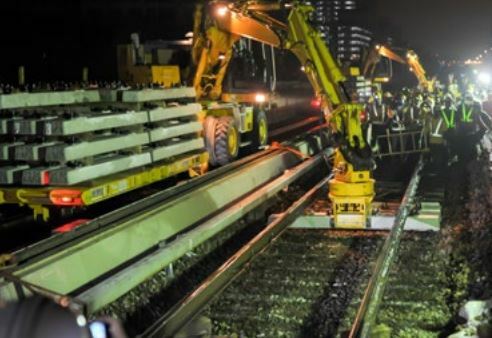 Working closely with LTA and rail contractors, the SMRT team achieved a major milestone when we finished replacing wooden sleepers on the North-South Line (NSL) with concrete sleepers in April 2015. The NSEWL were built with wooden sleepers. These sleepers support the rails on which our trains run. Some 188,000 sleepers are nearing the end of their 25-year lifespan. Exposure to the sun and rain over the years, vibration from moving trains and the weight each sleeper has to bear when a train passes over it add to the wear and tear. By renewing wooden sleepers with concrete sleepers that have a 50-year lifespan, journeys on the NSEWL will be safer and smoother for decades to come. Positive results from the sleeper replacement are already felt on the NSL. Journey times on the NSL have been reduced by around 10 per cent after the speed restrictions were fully lifted in May 2015. Wooden sleepers along the East-West Line (EWL) are now being replaced nightly. Steady progress is being made thanks to the experience gained by our engineers while carrying out the NSL sleeper replacement project. When the work is completed by the end of 2016, passengers travelling from Pasir Ris to Joo Koon on the EWL will also experience smoother train rides. The project is progressing well with 98% of the NSL completed and 76% of the EWL re-signalling work done. We have started trials to test the new signalling system on the NSL. Re-signalling is expected to be completed on the NSL in 2017 and on the EWL in 2018. The new signalling system will substantially improve the capacity of the NSEWL to run trains at shorter intervals. This would mean a shorter wait for trains, which would ease congestion at station platforms during peak periods. The capability will be maximised as the train fleet is progressively enlarged by end 2016 to allow more trains to be deployed on the NSEWL. More than half of the 57 new C151B trains for the NSEWL have been delivered by the middle of 2016. This underlines the importance of coordinating the multi-year, multi-project effort in rail renewal so that the combined benefits of these projects will give you a better journey on the rejuvenated NSEWL. Under the re-signalling project, the new signalling system supplied by Thales will see one of the most advanced train signalling systems in the world installed on the NSEWL. The current signalling system, which dates back to the 1980s, keeps trains a safe distance from one another by dividing the rail network into fixed segments of track length called blocks, with only one train allowed into each block at any time. These blocks measure between 800m to 1,000m in length. This Fixed Block system protects passengers in one train from other trains operating along the same line. The new signalling system uses advanced communications technology installed on trains to constantly update the traffic management system on the identity, location and speed of every train. The new system, which is more precise than the system it replaces, will lead to better use of the rail network because the footprint for each train, which includes the length of the train and the safety distance in front and behind the train, will be much smaller. This Moving Block system can be imagined as a safety bubble that moves with and protects the train, and will automatically slow down when it approaches a train ahead. This shorter distance will allow us to deploy more trains at shorter intervals on the rail network while maximising safety for passengers. When fully operational, the new system will allow trains to be spaced 100 seconds apart, which is a significant improvement from the 120 seconds between trains under the current system. The new signalling system is also designed with more redundancies, which makes it more reliable because major disruptive signal faults are less likely to occur. SMRT passenger trains are powered by electricity supplied by a powered steel rail. This rail is called the Third Rail because it is fixed next to and slightly above the two running rails on which the train wheels travel. The Third Rail replacement project currently being carried out on the NSEWL marks the first network-wide replacement for the 200km-long NSEWL Third Rail since SMRT operations began in 1987. The trains draw electricity from the powered rails through Current Collector Devices (CCD) that make contact with the rail and transfer electricity to the train’s electrical system. Each six-car MRT train has 24 CCD shoes that are in constant contact with the Third Rail when in motion and even when it makes a stop at MRT stations. Over the years, this constant contact adds to wear and tear of the Third Rail and the brackets that are used to support the weight of this steel rail. If the Third Rail sags due to worn out supports, power faults could occur. The Third Rail replacement project is timely as it will increase the reliability of the electrical system. The work involves turning off the power, unbolting the old Third Rails, replacing them with new ones and re-connecting the rails to the electricity network. We are making steady progress and expect to complete the work in early 2017. The C151 Kawasaki Heavy Industries (KHI) train entered service in 1987 while the C651 Siemens was introduced in 1994. SMRT is upgrading the 19 C651 Siemens trains as they have logged a higher number of train faults compared to other train models. Singapore Rail Engineering has completed two prototype trains and will be proceeding with the upgrade works on the C651 trains. When completed in 2018, the upgraded C651 Siemens trains will have new or refurbished train sub-systems such as new air conditioning, electric doors, brakes and propulsion systems. These have been the primary causes of delays due to train faults. Upgraded trains will also have sensors that furnish the Train Captain and engineering staff with the train’s state of health, thus making it easier to operate and maintain the train. The upgrade will include a makeover that gives our passengers a new-look cabin. Thirty new C151B trains, part of a fleet of 57 new trains for the NSEWL, have been delivered to Bishan and Tuas Depots where the trains are being fitted out and will be tested extensively. These trains, designed to operate with the new signalling system, will allow more trains to be run on the NSEWL. Before a new train enters operational service, SMRT’s engineering staff will work closely with LTA and the train manufacturer to get the new train ready. It takes about a year to do this. The work involves testing the air-conditioning, automatic doors and sensors, propulsion and brakes, communication equipment as well as interior fittings like seats, poles and handles. Every item will be rigorously tested before it is certified safe for passenger service. More new trains are on their way to Singapore and more than half of the 57 trains will be delivered by the end of 2016. Your Journey Matters – Edition 2 was published in October 2016 to update commuters on SMRT’s rail tranformation efforts to improve and renew the North-South and East-West Lines (NSEWL)- Singapore’s oldest, longest and most heavily used MRT lines. Air conditioning is crucial in keeping commuters cool on the train. An analysis on the most frequent causes of aircon failure for NSEWL trains has shown that a key cause is fuses in the aircon motors blowing out as a result of arcing caused by build up of carbon dust inside the motor. The source of the carbon dust is the carbon brush, a component in the aircon unit that is in contact with the aircon motor. A more effective cleaning method to remove excessive carbon dust build up has been implemented and new carbon brushes are being trialed to reduce the carbon build up. Microcards are like the brains of the aircon unit. When there is a defective microcard, the aircon does not function properly. In some situations, the unit fails to activate when temperatures get too high. Replacing defective microcards with new ones from the manufacturer is one solution, but SMRT has been working on a more sustainable solution. The Integrated Electronics Workshop team at SMRT has studied the microcard and has been refurbishing defective microcards. The trains’ aircon units use a gas known as freon as a refrigerant which cools the air. The freon gas cycles within the unit in a closed system of coils. If freon leaks from these coils, cooling efficiency is reduced. We are stepping up efforts to plug leaks in these tubes though a process known as “brazing”. The freon also needs to be topped up when leaks are discovered. The use of a recovery machine ensures that the precise composition of refrigerant is used to ensure cooling efficiency. The later models of trains on the NSEWL are equipped with the Trains Information Management System, or TIMS. TIMS is a system of sensors that measures various properties of the train during operations, such as measuring the internal temperature of each car. During service, train captains can check TIMS for any aircon faults. When faults are detected, a field team is activated. The team will then verify the fault and where possible, rectify the issue immediately. Further inspections on the reported aircon system will also be carried out when the train returns to the depot. The 8-hour disruption on the Bukit Panjang Light Rail Transit (BPLRT) on Wednesday 28 Sep 2016 shows that the ageing system continues to test the mettle of our engineering staff and the patience of users of Singapore’s first light rail system. In March this year, we indicated that it is time to relook the BPLRT as the system is nearing the end of its design life. A joint team with the Land Transport Authority (LTA) is currently reviewing the future of the BPLRT system with a view to completely transform the light rail system. It will be more than just a makeover. Aware of the design limitations of a light rail system which uses trains designed to function as airport shuttles on flat, short distance commutes between airport terminals, SMRT would like to share the options available for renewing the system. There are three options for the future of the BPLRT. The system has been operational since 1999 and is fast approaching its 20-year lifespan in 2019. Option 1: A people-mover like autonomous guided vehicles that travel on the existing viaducts but do not draw on external power. Option 2: A new conventional LRT system but with significant design enhancements in key infrastructure like power supply, signalling system, rolling stock as well as track and station assets. Option 3: Renewing the existing Bombardier system, keeping the AC power design but with a more advanced communications-based train control (CBTC) signalling system. The CBTC system will allow trains to be more accurately controlled by the operations control centre, allowing more trains to be operated on the network, while moving at faster speeds and closer headways if necessary. This means more people can take the trains and enjoy faster journeys. The rejuvenated BPLRT will be based on proven technology which is cost-effective to operate over its design life. The LTA-SMRT study team is also keeping track of the development and public transport services of Bukit Panjang town. This includes monitoring how the BPLRT system can be better integrated with heavy rail systems at the North-South Line and the Downtown Line. Another idea involves doing away with the 10.5km long, 14-station LRT network. The idea is for people in the Bukit Panjang area to be served by enhanced bus services. This is not far-fetched as a fully loaded high capacity bus like a double-decker bus can take 130 passengers, which is more than the 105-person capacity of a single Bombardier CX100 train car used on the BPLRT. These train cars are paired during peak hours, doubling capacity to 210 passengers. However, replacing the light rail with an all-bus option may lead to more congestion on the roads. The disruption last week has driven home the urgency of planning for the future. It is the latest incident that has put the BPLRT system in the media’s glare. The Straits Times said the Bukit Panjang Line “isn’t a paragon of reliability and its design makes it prone to glitches”. As we look to the future, SMRT engineers have also proposed short-term measures to boost the reliability of the legacy system. Key areas identified for renewal include the signalling system, the trains and track infrastructure. The last item includes the rail brackets that have given rise to problems on the line. These renewals will address recurring reliability issues involving track faults, traction power faults and signalling issues. Owing to reliability issues, the driverless LRT system is not living up to its name as Rovers have to be deployed at the stations, which were designed for unmanned operations. Meanwhile, near-term repair and maintenance measures of the system are being stepped up. This includes increased day-to-day system manning, and speedier recovery plans in event of disruption. Deploying staff across the network expedited assistance to passengers on Wednesday 28 Sep 2016 when passengers had to detrain to track at BP1 Choa Chu Kang station in the morning and at BP6 Bukit Panjang station around 5pm that day. A total of 26 additional staff have been added to the BPLRT team to enhance response time and assistance to commuters. The range of near-term measures should be complemented by an in-depth review of the BPLRT to future-proof the transport system. This will enable the future system to serve Bukit Panjang residents years from now by providing transport options for safe, reliable, comfortable journeys that are cost-effective to operate and maintain.